The (poorly-named) Nescafe Dolce Gusto Oblo Coffee Machine by Krups is capsule coffee machine that works with Nescafe pods. 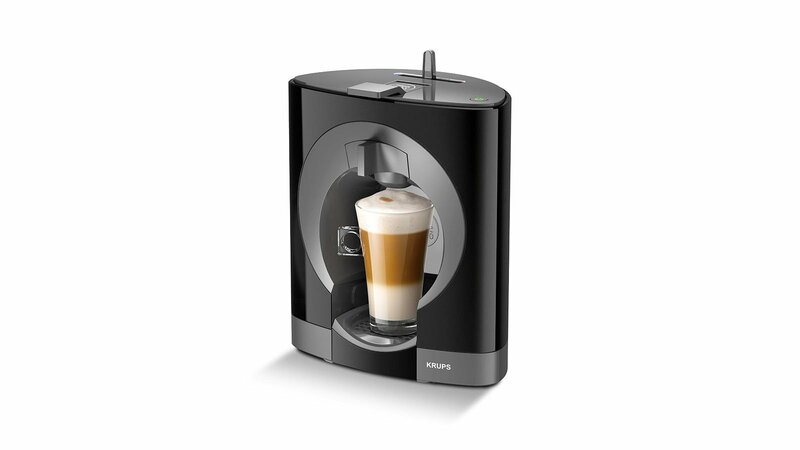 It has a unique design and simple functionality which make it one of the best coffee machines for a first-time buyer. Simplicity is at the heart of this machine, there is no milk steaming capability. However, Nescafe offers all-in-one pods like Skinny Cappucino. Meaning you cater to all tastes with this machine. And because it’s Nescafe pod compatible, buyers will have access to its full range of 30+ hot and cold drink options. See also: Nespresso Krups Prodigio review. As with all coffee capsule machines, operating is as simple as inserting a pod into the Gusto Oblo and pushing the clip down. It doesn’t include any fancy functionalities or automation. You need to use a lever to determine how much water you want to run through the pod. This can be a bit baffling as there are no water measurements on the tank, yet the suggestions on pod-packaging is in millilitres – so you’ll need to trust your judgement. After a few practices, and a keen eye on the coffee level in your cup, it becomes second nature. Also, it means your coffees can be customised for those who prefer different strengths. See also: De’Longhi Nescafe Dolce Gusto Eclipse Touch review. Cleaning the Gusto Oblo is equally simple, a consideration that is often an afterthought for the first-time buyer, but is very important. If you end up having to spend 10-15 minutes every day cleaning your machine, will you use it? Being a coffee capsule unit, the Gusto Oblo is a mess-free machine. Simply remove the used pod and add to your Nescafe pod recycling pile, and remove and rinse the drip tray under a tap. The design of the Gusto Oblo is actually quite smart. Where many machines are tall and narrow, this unit is wide but thin, with 24.5 x 18 x 31.5 cm dimensions. This means it is can fit on, in and under most benches and it’s resulting small footprint means it takes up even less room. It also comes with vivid black, white, orange or red meaning it can act as a focal piece or blend into its surroundings. However, its small and sleek design does result in a smaller water supply of a 0.8L tank. It also means, unfortunately, there is no used-pod holder so you do have to remove each one after its use. Something to note; don’t open the box expecting to pull out a heavy-duty, solid machine. This is a compact unit that feels sturdy yet plasticky. But considering the price and the quality coffee the Gusto Oblo produces, you can forgive its ‘cheap’ feel. If you’re a first-buyer looking for a coffee capsule machine, you’ll be pleased with a Gusto Oblo purchase. While a little fiddly being non-automatic, for its price, the quality coffee it brews and its sleek style make it a great first-starter.